The functioning of the second unit will go a long way in meeting southern India’s power demand, which goes up in the summer months, as an increasing number of homes and commerical establishments use air conditioning. The second unit of the Russian-built Kudankulam Nuclear Power Plant (KNPP) has reached its full capacity of 1,000 megawatts (MW) and is about to start commercial operations, a highly-placed Indian source told RIR. “After the synchronization of 1,000-MW second unit, the installed nuclear power generation capacity in India has reached almost 6,780 MW,” the source added. 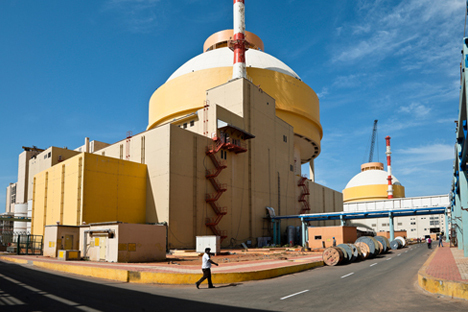 The Rosatom State Atomic Energy Corporation of Russia constructed the KNPP, which is now being operated in Tamil Nadu by The Nuclear Power Corporation of India (NPCIL). Along with two more units at KNPP, Rosatom is looking for a site in the state of Andhra Pradesh to construct six nuclear power units with a capacity of 1,200 MW each.